Last week we picked up our new family photo piece for the wall. Two weeks after Zachary was born I forced Jon into a photoshoot at a local studio with him on the other side of the camera. Zachary looked tiny and adorable and Alexander was on his cheekiest fine form. Beautiful photos of our beautiful boys. 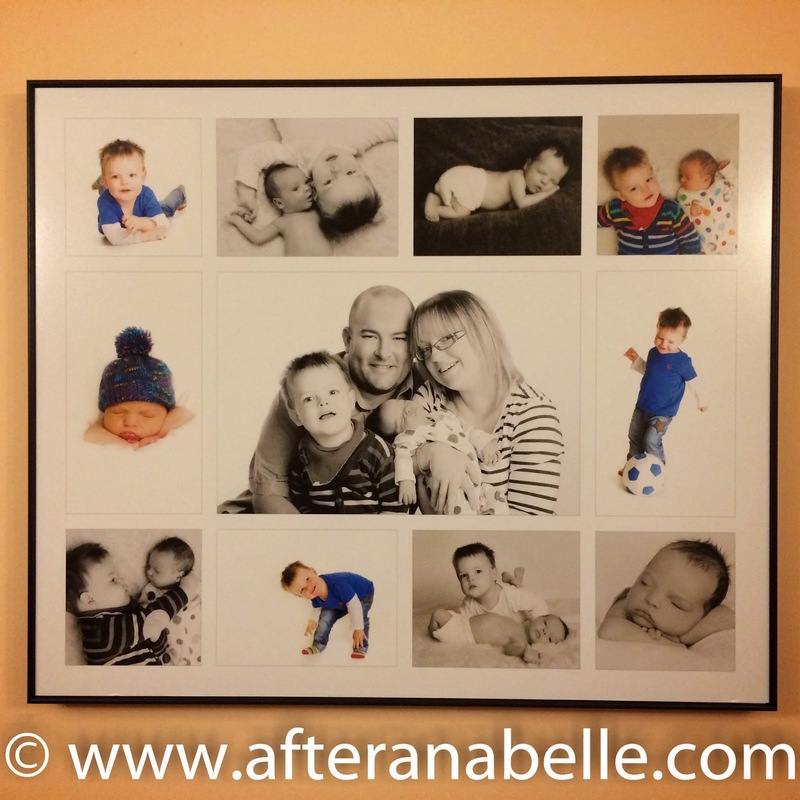 We were really pleased putting together the 'Storyboard' product; a photo of the four of us, surrounded by ten photographs of the boys together or individually. We love it! It has captured Xander's character so perfectly; happy, cheeky and busy. Zac so tiny, delicate and new. Us, the very proud parents. We are so chuffed with the new focal point of our living room. But still, I struggle with describing these photographs as family photographs. They are of course, but they're not all at the same time. Incomplete. She isn't there. Sitting here on the sofa across from where our storyboard hangs on the wall it is so obviously glaring at me. Anabelle, the girl missing from the beautiful picture. I see the family photo, there in the middle of all the other photos, I see it as it is, so proud of my two boys. I see how happy we are, (and we are happy), in love with those boys. And then I see it with the gap where Anabelle should be. Maybe she would have been stood behind Daddy leaning over his shoulder, her head near to Alexander or cuddled into the side of Mummy; Zachary between his two older siblings. We're a family of five, minus one.